Note: As part of the El Cerrito Centennial, Tom Panas will present a history of the library on February 9th at 6:30 pm. In 1913, when local citizens walked into the Post Office they found a new service. The Contra Costa County Library, established in Martinez in 1913, was setting up branches throughout the county. County Librarian Alice Whitbeck had announced that anyone could start a library and Faye Breneman, a teacher at Fairmont school in Rust (as the area was known in those days), had taken up the challenge. Space for two locked cases of 50 to 100 books was obtained on shelves in the post office and the Rust Branch Library opened. As Librarian, Faye spent three afternoons a week serving 93 library cardholders. Because she could not receive another county salary in addition to her teacher’s pay, her Librarian’s salary of $5.00 per month was sent to her mother. 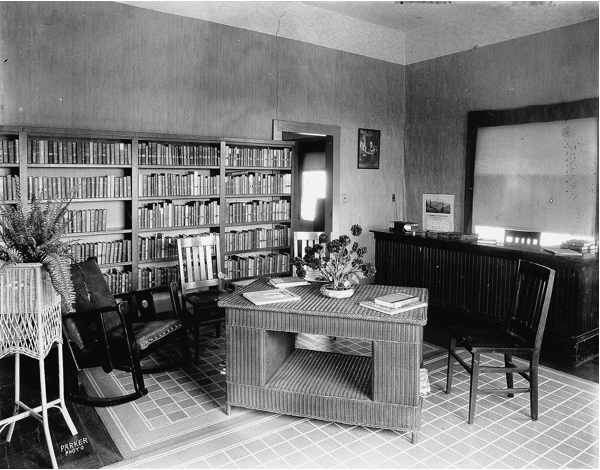 El Cerrito Library at the Breneman house in early 1900s. Source: Friends of El Cerrito Library. In 1915 the library was moved to the Breneman home on San Pablo Avenue, where Faye’s mother and sisters volunteered to help with the growing collection. The local community was beginning to use the name El Cerrito and in 1916 the Rust Branch Library became the El Cerrito Branch Library. The advantage of being part of the county system was (and still is) the access to the countywide collection of books, which can be requested and borrowed through any branch. El Cerrito Library on Fairmount Ave. in 1925. Source: Friends of El Cerrito Library. By 1925 the library had outgrown the Breneman home, so the volunteer El Cerrito Improvement Association renovated and equipped the house at the northwest corner of Fairmount Avenue and Liberty Street. The Association also paid the rent until the city took it over. Thus began the current arrangement whereby the city owns and maintains the library building while the county pays the salaries and owns the books. Dedication of the new library on Fairmount Avenue was held on June 2, 1925. The ceremony was attended by prominent citizens of El Cerrito, Martinez, Antioch and Richmond and was followed by music and dancing at nearby Huber Hall. 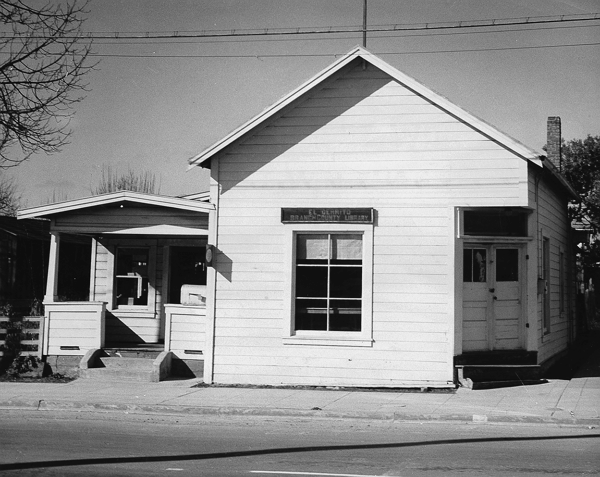 El Cerrito Library on Stockton Ave. in 1948. Source: Friends of El Cerrito Library. By 1946 the need for a larger, more modern library had become obvious and the City Council established a committee to plan for expansion. A site at the corner of Stockton and Lexington was selected, Mr. Harry A. Bruno was named architect, and the City arranged financing. The new library was dedicated on February 27, 1949. Rose Vainstain, a graduate of Western Reserve University School of Library Science, was appointed the first professional librarian. The County Librarian’s goal was to have every branch headed by a person with a master’s degree from an accredited school or college of library science. Faye Breneman remained on the staff as Children’s Librarian. 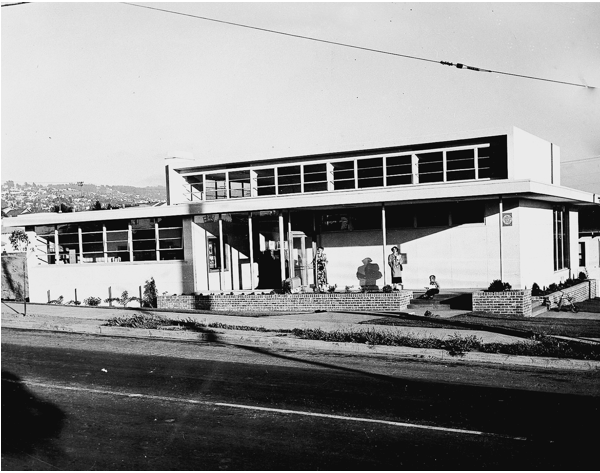 El Cerrito Library on Stockton Ave. in 1960. Source: Friends of El Cerrito Library. By the late 1950s the library, which seemed so spacious when it opened as the first post-war library built in the Bay Area, was clearly too small for the growing city. In October of 1959 a bond issue of $100,000 was passed for enlarging and remodeling the library. Dedication of the upgraded facility was held on November 12, 1960. Unfortunately, in more recent years the picture has not been so bright. As a result of state funding cuts and failed county library service ballot measures over the last twenty-five years, the El Cerrito Branch Library’s open hours have been cut from 63 hours to 35 hours weekly and the budgets for both staff hours and the purchase of books and other materials have seen similar reductions. In spite of the cutbacks the branch maintains a large collection of books, periodicals, tapes and videos. The El Cerrito library circulated 179,600 items in the year ended June 30, 2011. Shelf space and study tables are at full capacity and computer access has to be limited. The staff workspace is terribly overcrowded and the need for a larger and more up to date facility is again obvious. The citizens of El Cerrito, the library staff, and the many volunteers who contribute their time are looking forward the day when we have an upgraded, larger, and more modern El Cerrito Library.